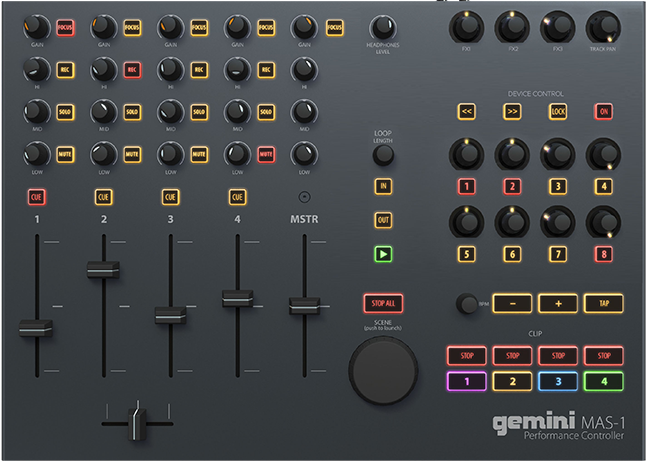 MAS-1 is the fist MIDI controller released by Gemini: a leading DJ audio equipment manufacturer. 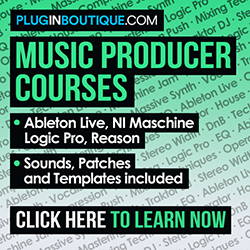 It’s designed to work with Ableton Live, but maintaining the DJ-style approach. The product has a built-in 4-channel audio interface, and will work as a 4-channel mixer. It has traditional channel strips, and each channel comes with a volume slider, Rec, Solo and Mute buttons, Hi, Mid and Low EQ knobs, and Focus buttons with a Gain knob. There’s also a Master fader, with similar controls. When the user activates the Focus button on any channel, it will chain the selected channel to the right side of the product, where it will be possible to control other track parameters, such as FX, Pan, devices, macros, and more. MAS-1 also has a clip section, where each one of the four tracks will have dedicated play and stop buttons, as well as tap tempo and tempo up and down buttons. The unit comes with a Scene control large knob. So, it’s possible to scroll up and down the scenes and the user will launch a scene by just pressing the Scene knob. Since it is a product designed for DJs, it has a crossfader control, totally compatible with Ableton Live’s crossfader feature. The rear panel has left and right XLR and also unbalanced RCA outputs. There’s an USB port for connection to the computer, as well as power supply jack (power adapter included).